The perfect solution for any balcony, The Balcony Bar requires minimal area, yet retains complete functionality. The sleek design allows you to enjoy your view without sacrificing your space. The Balcony Bar is among the highest quality of balcony furniture on the market. The design is great for a small balcony or veranda. Our buyers also love that it allows them to sit at the railing and enjoy their beautiful view, whether that be at the beach, the city, mountain, or country side! Dimensions 13.5 In. X 48.0 In. X 40.5 In. This Balcony Bar set is just excellent for Us. We live in a little condo unit with not to much room in our balcony for any more furniture without compromising space and very functional. However this set makes our space more efficient for enough room for other things. We are in love with it, is very well made. It sure can take any kind of weather. I believe is made from aluminum. So, it's been almost a year and there is no rust. The brackets behind bar are very strong for sure, during "Hurricane Matthew" this past week, we took everything inside our unit. Except the Bar again against the rails. It never move. I love sitting and enjoying the view from my balcony. 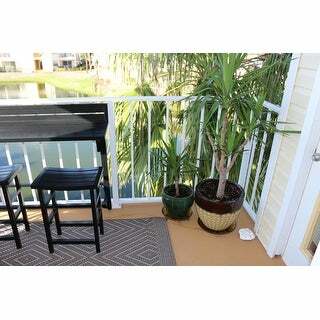 I have a small balcony and this is perfect. It looks great and quality is good. Love this balcony bar!! 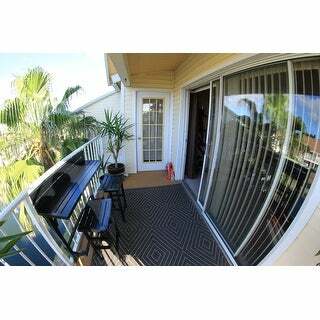 High quality, extremely functional and turns our narrow balcony into another room for summer. And customer service regarding a small problem was exceptional. Great product! We are enjoying every bit of this balcony bar and fits well in our tight space. Very well constructed and material is really durable. A must buy. We used on a small balcony at a prior house and now its bolted to the wall in our screened in porch as the bar! It's pretty easy to assemble other than missing some hardware and having to file a corner to make one of the legs fit on one of the chairs. The mounting hardware is made for balconies with rails so I had to purchase masonry bolts for my application. It's a great set but pricey for what you get. Hope it will last for years. Love this bar set, already bought 2 & might get another 2! They are along the perimeter of my large top deck, takes up minimal space but adds seating and places to set drinks & ashtrays on. Neighbors are all jealous! Bought 3 sets in white for my deck to attach to white rails. Is very good quality and easy clear instructions for assembly. Would highly recommend this product. Love this so much, I want to buy two! Perfect size for my new patio! I love the way it looks! Such a smart idea that the stools fit nicely under the bar so they take up less space & because it keeps them from blowing over! We love this order! We don't generally get excited about furniture but since we've received this item we've been outside every nice evening. As a matter of fact we're ordering another one which is why I'm bothering to write this review. Just an FYI, it will take a while to put together. I totally love this little bar. Adding it to the side of our hot tub as a walk up bar to visit with those people inside the hot tub!! 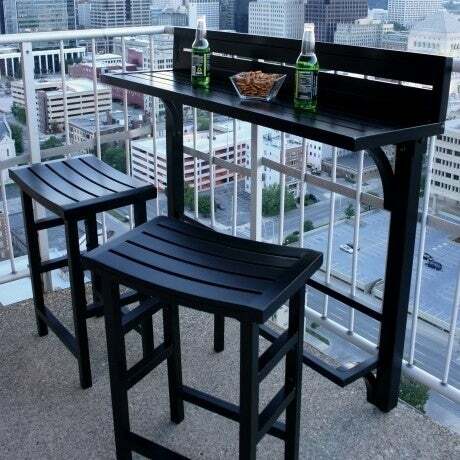 Absolutely perfect for a deck! We bought it for our son and he couldn’t be happier! Easy to assemble and well made. We actually use it in a small gazebo poolside. This is a nice quality heavy piece. My son moved and we could not find a spot for it for awhile. It must be attached to something soes not stand alone. It is now attached to the side of the house in the griling area and it couldn't be more perfect. "In the dimensions which number is the height?" "Does it require a balcony rail or can it still stand on its own without one?" 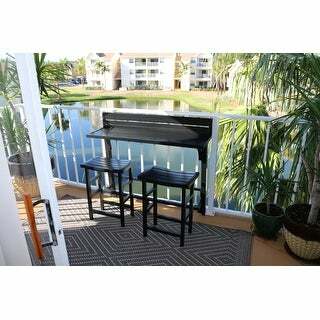 "My balcony railing is solid glass with a hand rail metal “cap” that is slightly rounded and 6” wide by 2” thick. Is there a way to attach the bar table securely in my situation?" Chose because of positive reviews and aluminum construction for weather resistance. "How does this attach to the railing? I live in an apartment and can’t drill holes in the balcony railing." There are 2 rubber coated "J-Hooks" that grab a hold of your balcony from under the bar. You simply tighten down a couple of wing nuts. The bar tightens down so well it is like the bar and the railing are welded together. We also offer a solution for glass / solid surface railings. Just let us know when you purchase and will include what you need. "What are the product dimensions?" This is approximately 48 inches wide x 13.5 inches deep x 40.5 inches tall. "Can this attach to siding on the exterior of a house? " Most likely this would work well attached to the siding on the exterior of a house. Safavieh Outdoor Living Griffen Balcony Dining Cabinet Set - Natural - table: 25.6" x 13.8" x 50.4"/chair: 14.9" x 23.3" x 31.9"